The outer part of the upper leaf has a lunar volvelle with zodiac and a calendar scale (probably incomplete). 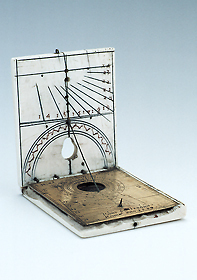 There are two linear incisions as decoration on the sides and a compass viewing hole. The inner side of the upper leaf has a pin gnomon dial (pin missing) for Italian hours from 14 to 24 and, below it, a decoration in the form of an arch. The inner part of the lower leaf is completely covered by a gilt brass plate with a hole for the compass. The plate is engraved with common hours from 4 to 12 to 8, for a string gnomon dial adjustable for latitudes 45?, 48? and 51?. At the top corners is inscribed 'A 44. ad 52 gradum'. Below the dial is a pin gnomon dial for Italian hours marked from 10 to 23 and the inscription 'Polus 42 Gradum Roma an<n>o 1589'. The outer part of the lower leaf is blank.